Supporting Biodiversity? or just Garden Art? Ever wondered where all those bugs go in the winter or when it rains? They don’t pack their bags and take a flight to Noosa like some lucky retirees do when the temperature drops below 21 degrees. 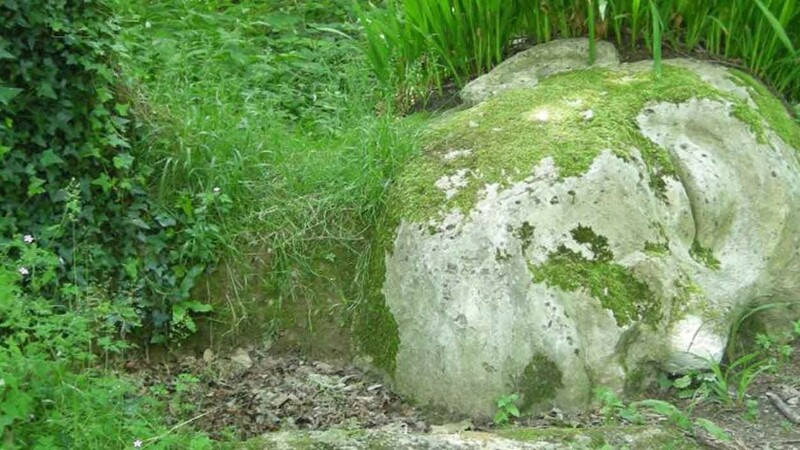 They seek out a nook or cranny to take five when they need a break, to lay some eggs or find shelter. Given that we have destroyed a lot of their natural habitat, an insect hotel can be just what they need. The word “insect” conjures up a whole range of images. Children talk to me about lady bugs, butterflies, bees and maybe snails (I haven’t the heart to correct any child under 10 years that snails are not really insects they are molluscs), cute creatures that dot the landscape with beauty, just like flowers in the garden, fuzzy animals and sunshine. 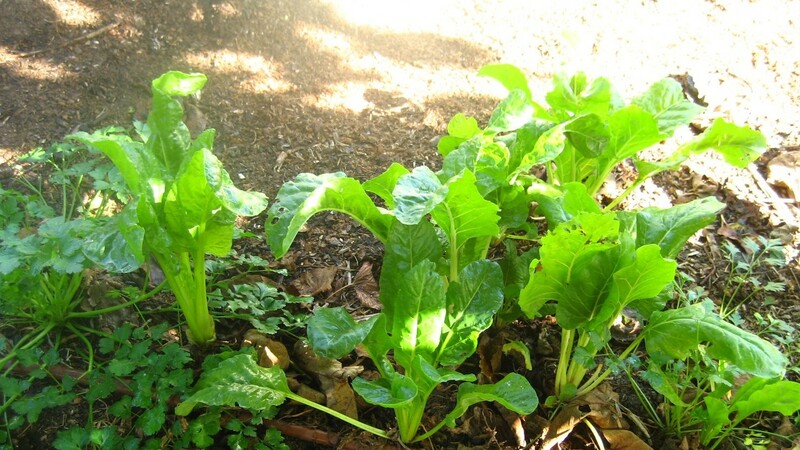 By the time they are adults they might think of flies, stinging wasps and bees, termites, mosquitoes and those annoying critters that might interrupt a perfectly good day or beat us to our home grown vegetables before we get a chance to pick them. But love them or hate them, they are here for a very good reason, and there are billions of them behind the scenes performing tasks that we humans are largely oblivious to. Back in the time before garbage collection services, recycling plants, landfill, garden maintenance crews, graveyards, septic systems and road kill collection the animals and insects had it all sorted out. As lifecycles started and ended, it was the insects who would come along and deal with all the debris and carcasses that were left over and devour them, breaking down the once living and depositing their molecules back in the earth ready for new lifecycles to start. Sure, they missed a few dinosaur bones, but every creature had its role and its time and life on earth was lush and abundant. The insects still do this today where they can, in our own compost bins if we are lucky and our bushlands, and if not in our own backyards, we can go to our local nursery and buy that stuff in bags or by the truck load. Even after destroying most of their habitats and interrupting these precious natural ecosystems through mass urbanisation, mining, logging and all the other ways we humans put at the top of the priority list, these insects are still going strong. It is not their fault that we sometimes build our houses with the most prized food source (wood) for things like termites. Just imagine if we had parts of our towns built out of chocolate and trying to stop the people in the neighbourhood from eating it! And lucky for us these insects do still keep doing what they doing a pretty good job of “housekeeping” and their own special style of landscaping. Another crucial role that these humble creatures play is pollination. Without it one third of our food crops would not produce fruit or set seed for the next generation. Bees are currently in real crisis. There is a large shortage of honey bees in our cities and urban sprawls and native bees and wasps have limited or no habitats. There has recently been a movement to set up hives set up in city areas to encourage bees to take up safer residences and to help the humble city dwelling gardener get their veggie patches to produce. Bee one Third is one such movement in Brisbane installing bee hives on unused roof tops through the city. However, little is known about our own native (largely) stingless wasps and bees that are also good pollinators. Enter the insect hotel. 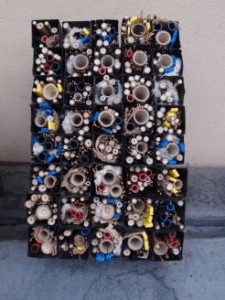 Insect hotels all have one thing in common – they provide smooth, cylindrical spaces, 4 – 9 mm in diameter and at least 15 cm deep, perfect for the native stingless bees and wasps who are solitary by nature, and who use these spaces to hatch their young. Because our parks, gardens, cities, public and private spaces are kept neat, clean and safe, there are very few dead branches left lying around to provide the crevices for bee nurseries. In building a bee hotel you can use material from nature like bamboo sticks or holes drilled into wood, or cylindrical products of manufacturing like old bits of hose or straws. Some materials I have used include seed pods, coir matting, clumps of match stick blind cut offs, wool, miniature vases, anything really, you are limited only by your imagination. Just bear in mind that the materials should be non-toxic, and to use non-toxic adhesives and paints. Bees are not fussy about what they use or what it looks like as long as it fits their needs and is in a sheltered spot out of strong sun and rain. By the way, that is another key to the robust nature of the insect species, they may be fragile and small but they are very adaptable! If you don’t have such a spot, make the “roof” of the hotel hang over the entrances. Insect eggs hatch when the temperature and climate are just right for some spring action. Some insects which lay eggs on plants ensure that their offspring have a banquet when they hatch – this is why companion planting bug-friendly plants is also crucial to a healthy garden. Other insects will just deposit eggs in a safe, sheltered space out of sight from predators and protected from the elements – such as in an insect hotel. So is an Insect Hotel for you? If you noticed that the insects you don’t want just keep coming back, then increasing insect biodiversity (lots of different types in your space) is the way to go. Lady bugs can eat 500-5,000 aphids in their 3 week life span, and lay hundreds of eggs during that time. Having the praying mantis in your garden is another golden ticket to a garden’s success. They are like the lions of the insect world, and are not fussy eaters, eating hundreds of anything from small ants to large moths. The list goes on. So the more bug varieties you can have in your garden the more of a balance you can create. Oh, and because your insect hotel will be in your garden or in a sheltered spot under your house eaves or in front of a window, you might want to give it some bling. Using shiny pieces of glass or coloured pieces of plastic which might otherwise end up in landfill will turn your clump of nature into a work of art. 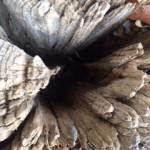 Do insect hotels work? 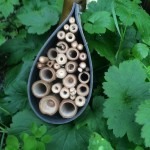 Yes, most definitely for solitary bees and wasps, and you will know this when one of your cylinders is covered by a dot of mud or if you hear the critter buzzing away before hatching. And as these places are used for hiding, sheltering and overwintering, you may only know by noticing them more in the garden when they are out and about and doing their jobs. So pick your fights and make friends with your garden bugs. Insect hotel or not, they are out there and they are here to stay. Kat Veilgaard Irwin has a background in philosophy, horticulture and permaculture, works part time at a garden centre and also runs Environmental Art and Sustainable Gardening workshops with children and adults, where she gets to combine her passion for the environment and her creative artistic side.